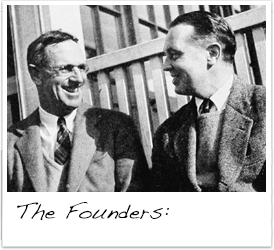 In the fall of 1928, Scarsdale, NY neighbors James (Jimmy) Cogswell and Fessenden (Fess) Blanchard were on a hunt for an outdoors winter sport close to home. 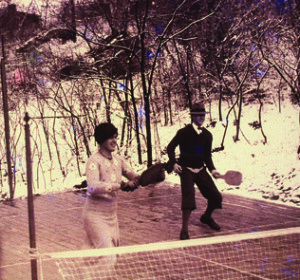 This led them to build a multi-purpose wooden platform on a small strip of land on Cogswell’s property for deck tennis, badminton or volleyball. 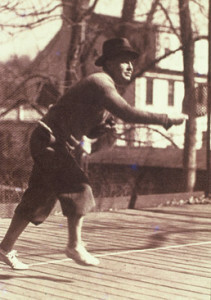 The size and shape of that strip of land had a significant effect on the whole future of Platform Paddle Tennis. The job was completed by the end of November 1928. The result was a 48′ x 20′ green platform marked out for both badminton and deck tennis. The landscape proved a challenge. The platform couldn’t be wider than 20 feet without raising it over a rock. The ground fell off so sharply at 48 feet in length that a major operation would be required to increase it. Volleyball was no longer an option. 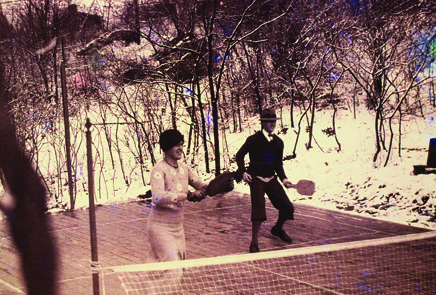 They quickly realized that the unsheltered spot also was not ideal for badminton, so the platform was largely used for deck tennis.